The Biggest Climate Rollback Yet? Since taking office in January of last year, the Trump administration has moved aggressively to dismantle climate regulations put in place under the Obama administration. This includes the Clean Power Plan, which the Environmental Protection Agency (EPA) announced last October it would not be implementing, and a range of federal regulations aimed at reducing methane emissions from oil and gas production. Today, the administration announced what could be the most environmentally significant regulatory rollback yet. The EPA and the National Highway Transport Safety Administration (NHTSA) issued a Notice of Proposed Rulemaking (NPRM) to freeze the fuel economy and greenhouse gas (GHG) emissions standards for cars at light trucks at 2020 levels through 2026 and revoke the ability of California and allied states to set their own more stringent standards. In this note, we analyze the impact of the proposal on US oil consumption and GHG emissions and compare it to other recent regulatory rollbacks by the Trump administration. The Obama administration during its last month in office finalized a required “mid-term review” of federal fuel economy and GHG emission standards for passenger vehicles for model years (MY) 2022-2025. In March of 2017, President Trump announced his EPA would be revisiting that decision. The nearly 1000-page NPRM lays out a few of possible approaches to doing so. The Agency’s preferred option would not only adjust the MY 2022-2025 standards, but the 2021 standards as well, freezing them at MY 2020 levels rather than maintaining the year-over-year increases. The proposal would also revoke California and allied states’ ability under the Clean Air Act to set their own, more stringent, standards. Following today’s action, the EPA and NHTSA will accept comments on the proposed rule for 60 days and then issue a final rule. That rule will almost certainly be challenged in the courts – particularly if the Trump administration proceeds with the removal of California’s waiver. 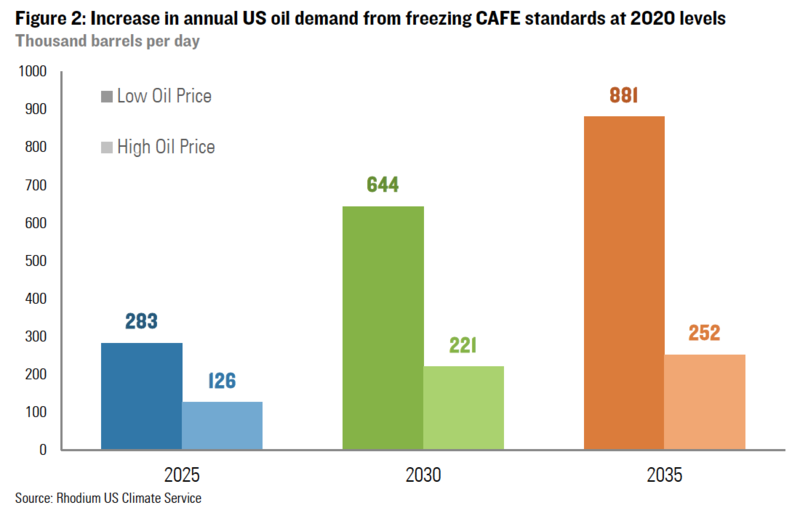 Back in May, we analyzed the potential impact of a CAFE freeze on both US oil demand and GHG emissions. We noted that both largely depend on what happens to the price of oil in the years ahead. Because CAFE standards are based on vehicle footprints, the ultimate impact of the standards depends in large part on which types of cars people buy. That, in turn, depends on prices at the pump. Higher prices push consumers toward vehicles with a smaller footprint, increasing fleetwide average fuel economy. When prices are low, as they are today, Americans buy bigger cars and the fleetwide average declines. Last year, light trucks made up 65% of total vehicle sales. That is up from about 50% in 2012 when oil prices were at their peak. CAFE standards allow automakers to cater to these trends, producing more vehicles within the larger footprint category. While fleetwide fuel economy improvements are slower when oil prices are lower, standards play a more important role in driving improvements than oil price-driven changes in vehicle purchase decisions and manufacturer investments alone. The NPRM announced today aligns pretty closely with what we analyzed in May. We modeled the original Obama-era standards and the impact of freezing standards at MY 2020 standards under the reference, low, and high oil price scenarios projected by the U.S. Energy Information Agency (EIA) in its 2018 Annual Energy Outlook (AEO2018). This captures a pretty wide range of potential oil prices – from $32 a barrel to $158 a barrel West Texas Intermediate Crude Oil Prices (WTI) in 2017 dollars. In the reference scenario, crude oil prices rise from just under $70 today to $83 in 2025 and $89 in 2030. In this analysis, we also assumed the Trump administration is successful in revoking the waiver allowing California, 12 aligned states, and the District of Columbia waiver under the Clean Air Act to impose more stringent standards – something those states will be fighting hard to prevent in the courts. Under Obama-era standards, fleetwide fuel economy rises from 32 mpg today to between 44 and 46 mpg in 2025, depending on the price of oil (Figure 1). Without updated standards after 2025, fuel economy improvements level off at lower oil prices and grow modestly at higher oil prices. 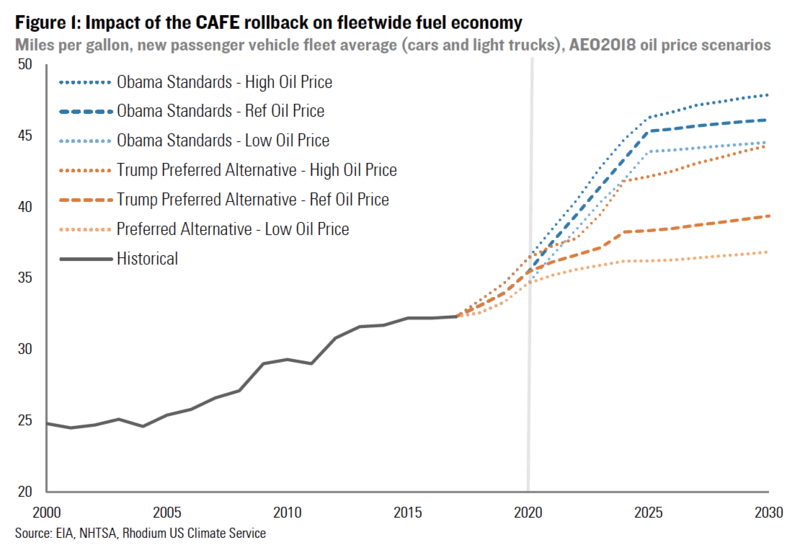 If the Trump administration proceeds to freeze CAFE standards at 2020 levels, the fleetwide average reaches only about 38 mpg in 2025 under AEO 2018 reference oil prices, 36 mpg in a low oil price environment and 42 mpg under high oil prices. If successfully implemented, the NPRM “Preferred Alternative” would increase US oil consumption by between 126,000 and 283,000 barrels per day in 2025, depending on oil prices (Figure 2). With no change in the post-2025 standards, by 2030 the impact grows to 221,000-644,000, as more of the vehicle fleet has been sold under the MY 2020-2025 rules. By 2035 US oil consumption is between 252,000 and 881,000 barrels per day higher. The upper end of the range equates to more transportation oil consumption than currently occurs in any state other than California and Texas, and more than total annual oil production in Alaska. Purchasing this oil would cost drivers an additional $193 to $236 billion cumulatively between now and 2035, again depending on oil prices. This increase in oil consumption has modest GHG emissions implications in 2025 relative to recent power sector developments, but the magnitude grows over time. In 2025, US energy-related carbon dioxide (CO2) will be 16 to 37 million metric tons (MMt) higher if CAFE standards are frozen at 2020 levels. That translates into a 0.3% to 0.7% change in overall US GHG emissions that year based on projections in our Taking Stock report from last month. By 2030 this grows to 28 to 83 MMt, again assuming there are no post-2025 standards in place. By 2035 the gap widens to 32 to 114 million metric tons depending on oil prices. On a cumulative basis, the proposal would increase US CO2 emissions by 321 to 931 MMt between 2022 and 2035. How does the emissions impact of this proposal stack up against other regulatory rollbacks by the Trump administration? To answer that question we updated our 2017 analysis of the emissions impact of the Clean Power Plan, and our assessment of the impact of Trump administration actions on oil and gas methane included in our Taking Stock report. As part of our Taking Stock analysis, we produce power sector emissions forecasts for all 50 states under a range of renewable energy and natural gas cost scenarios. These are available to US Climate Service clients through our ClimateDeck. We compared these projections to the state-level targets included in the CPP to assess the emissions impact of its removal. 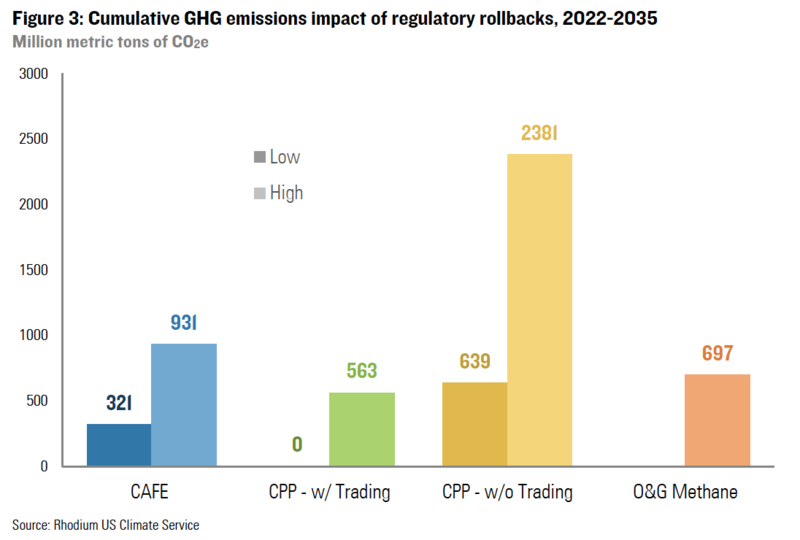 We hold the targets constant at 2030 levels through 2035 for an apples-to-apples comparison with our CAFE analysis, though it’s possible post-2025 CAFE standards and post-2030 CPP targets would have been raised by a different administration. Assuming states engaged in trading under the CPP, it would have been non-binding in a cheap renewables and cheap gas scenario and would have reduced emissions by up to 563 MMt between 2022 and 2035 with more expensive gas and renewables (Figure 3). If states did not engage in trading, the cumulative emissions impact of the CPP would have been between 639 and 2,381 MMt between 2022 and 2035 depending on the price of natural gas and renewables. 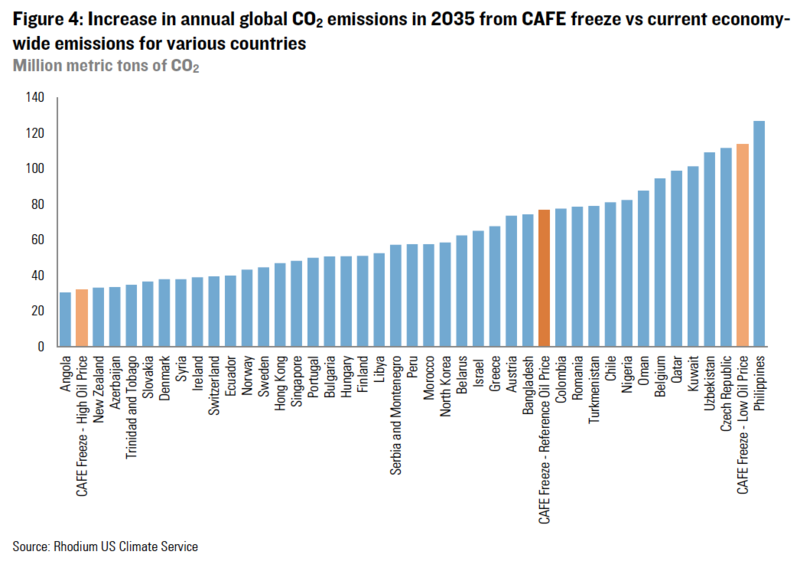 Today’s proposal to freeze CAFE standards at 2020 levels would also likely have a larger emissions impact than the Trump administration’s moves weaken Obama administration regulations on methane emissions from oil and gas production – either through rollback or lack of enforcement. Based on analysis from the Clean Air Task Force, in our Taking Stock report, we estimate that such moves have the potential to increase GHG emissions by up to 697 MMt on a cumulative basis between 2022 and 2035 (Figure 3). In a fact sheet released today alongside the NPRM, EPA and NHTSA estimate that the proposal would increase global CO2 concentrations by 0.65 parts per million (ppm) and argue that since this is small share of the global total the emissions impact of the proposal is irrelevant. But any individual policy action in any individual country when viewed in isolation will always look like a trivial contribution to addressing a global challenge. It is the combination of these actions that deliver meaningful reductions in global emissions. And as far as individual policy actions go, this one is significant. At our upper bound estimate, the increase in annual CO2 emissions resulting from the NPRM by 2035 would be larger than the total national annual emissions today of 82% of the countries on earth, and larger than the COMBINED annual CO2 emissions of the 70 smallest countries in the world. In the context of the global effort to address climate change, this NPRM would be a pretty meaningful setback.